Doctors can roll an MRI machine suspended by ceiling tracks from its “garage,” located behind the stainless steel doors, into one of two intra-operative surgical suites during a procedure to perform scans without moving the patient. Inside Jacobs Medical Center at UC San Diego Health in La Jolla resides the only intra-operative magnetic resonance imaging surgical suites in Southern California — a high-tech hybrid that gives surgeons access to advanced MRI technology during procedures. Currently, the intra-operative MRI surgical suites are used primarily for highly complex neurosurgical cases, allowing surgeons to perform complicated cranial procedures with greater levels of precision through the use of integrated navigation and visualization MRI technologies so that neither surgeons nor patients need to leave the operating room for additional scans. The intra-operative MRI surgical suite consists of two operating rooms with an MRI machine housed in a “garage” between them. 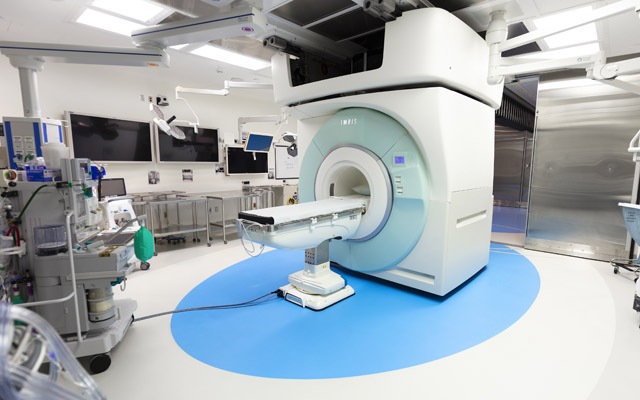 Mounted on ceiling tracks, the MRI machine can be rotated and moved into either room to perform scans of patients already on the operating table. Surgeons can use MRI to provide guidance when performing procedures, such as deep brain stimulation or laser ablation, or to ensure complete tumor removal. Because the MRI uses a large and powerful magnet, all surgical room supplies must be made from magnet-safe materials, such as these plastic scissors. Khalessi performed the first surgery using intra-operative MRI technology on Angie Weight, a 41-year-old artist and mother of four diagnosed with oligodendroglioma — a rare type of cancer that is difficult to diagnose and treat because of how and where tumors are found in the brain. In Weight’s case, Khalessi used the suite’s MRI technology to ensure that her tumor was entirely removed and no diseased tissue remained all while Weight was still under anesthesia. Weight has completely recovered and returned home to her family and work. Candidates for intra-operative MRI technology are carefully selected. Because the MRI uses a large, powerful magnet to create images, many safety precautions must be taken. Implanted medical devices, such as pacemakers, or any implanted ferrous metal can disqualify potential patients. Additionally, all metal instruments used are rigorously tested and repeatedly counted to ensure they pose no safety risk to patient or medical staff during procedures. In the future, Khalessi said, the suites will be used for procedures requiring precise delivery of biological agents, such as stem cells or immunotherapies. In addition to the intra-operative MRI surgical suites, UC San Diego Health features two intra-operative computed tomography scan surgical suites, six DaVinci surgical robots and is home to the Center for the Future of Surgery (CFS), where UC San Diego Health surgeons and scientists develop, test and teach new techniques and technologies in surgery. The CFS will soon add a new 16-station microsurgical lab and hybrid operating room to expand its capabilities and mission. The intra-operative MRI technology is manufactured by IMRIS.